My oil painting of Joey Dunlop’s 26th and final Isle of Man TT Victory in the 2000 Ultra Lightweight 125 TT on the Honda RS125 is now completed. The scene shows ‘Yer Maun’ rounding Braddan Bridge on the famous Isle of Man TT course on his way to that record 26 TT victories. The art is also being reproduced as a limited edition fine art print with permission from Joey’s widow Linda Dunlop. The Giclée print is available in A4, A3 or A2 sizes with free UK P&P. 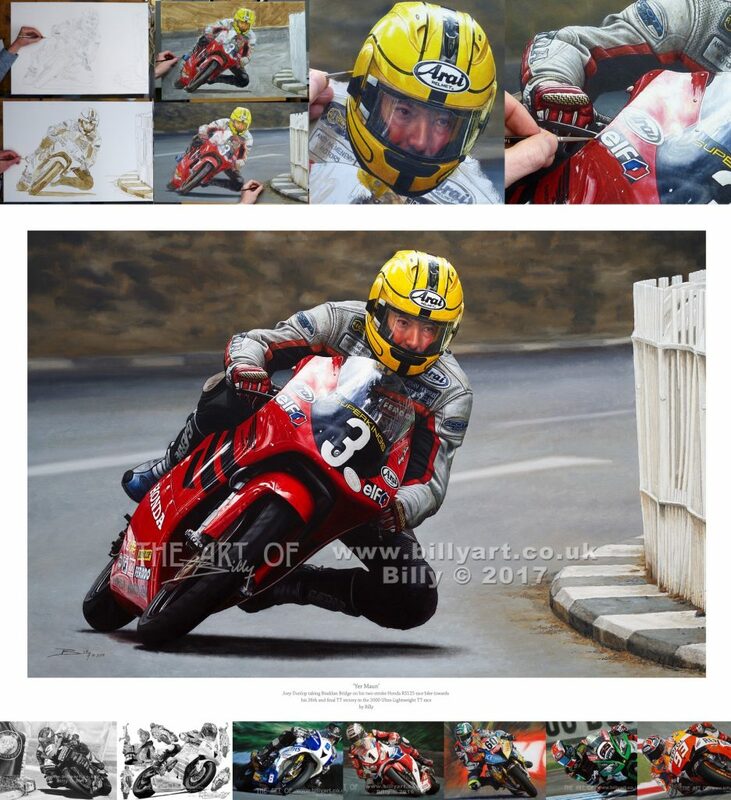 Check out the website for all the details and the full HD time-lapse video of the Joey Dunlop art. Joey Dunlop ‘Yer Maun’ 2000 Ultra-Lightweight Isle of Man TT oil on linen canvas painting by Billy of Joey’s 26th and final TT victory. The oil painting shows Joey taking Braddan Bridge corner on the famous Mountain course. This entry was posted in Uncategorized on 01/06/2017 by billy. Here is the Part 2 video which covers the very basics of shading. From pencil and grade choice through to smudging techniques with a little bit on how light affects objects and how using an eraser (rubber for UK artists) is part of an artist’s drawing tool kit. After that it is down to just enjoying your art and practice, practice and decades later keep on practicing. This entry was posted in Uncategorized on 22/06/2014 by billy. Britain’s wealthiest 1000 people are worth £520bn according to information published in the Sunday Times Rich List 2014. This entry was posted in Uncategorized on 18/05/2014 by billy. (con) ‘Artist’ Luke Jerram in Bristol today (May the 4th be with you) had a water slide (long one 295 feet or 90 metres in new money) set up down Park Street in Bristol. Now does this mean that every water slide in every water theme park is ‘art’? Or is it just that an ‘artist’ managed to convince the Bristol Council to just ‘have a bit of fun’? Does it mean that everything an ‘artist’ does is art? Using the toilet, unblocking the drains, mowing the lawn, reading a book is an installation? One thing for sure is that a very long water slide is a great laugh but another thing for sure is it certainly isn’t art, it is an event and made a lot of folks smile which can’t be bad – well done Luke for that. This entry was posted in Uncategorized and tagged Art, bristol, cobblers, conman, fun, waterslide on 04/05/2014 by billy.